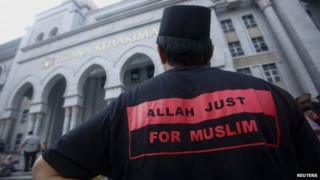 Malaysia's highest court has rejected a challenge to the ban on Christians using the word "Allah" to refer to God, in a highly divisive legal case in the Muslim-majority nation. The case was brought by the Catholic Church, which sought to overturn a ban first put in place in 2007. But the Federal Court said an earlier ruling backing the ban was correct. The case began over the use of "Allah" to refer to the Christian God in the Catholic Church's Malay-language paper. People of all faiths use the word Allah in Malay to refer to their deities. Malaysian authorities say its use by Christians could confuse Muslims and lead some to convert to Christianity. Malay Muslims make up almost two-thirds of the country's population, but there are large Hindu and Christian communities. The long-running case has proved very controversial, sparking impassioned debate and leading to occasional attacks on mosques and churches. The Catholic Church's newspaper, The Herald, appealed against the initial ban and in 2009 a court ruled in its favour, but that judgement that was later overturned by the Court of Appeal. This ruling was handed down by a seven-member panel, which voted by 4-3 to dismiss the challenge. Herald editor Father Lawrence Andrew said he was "greatly disappointed" by the judgement which "didn't touch on the fundamental rights of minorities". Muslim activists outside the court welcomed the decision, however. S Selvarajah, one of the lawyers for the Church, said the ruling marked the end of legal proceedings. "It's a blanket ban. Non-Muslims cannot use the word," he told AFP news agency. But reports in Malaysian newspapers suggested the Church could call for a review of the decision.